The independent Annual Sustainable Economy Survey (iASES, formerly iAGS) brings together a group of internationally competitive economists to provide an independent alternative to the Annual Growth Survey (AGS) published by the European Commission. The iASES is published simultaneously with the Annual Growth Survey of the European Commission at the start of the European semester. The initial project emerged seven years ago and was referred to as the independent Annual Growth Study (iAGS). Within our project team, we decided to give more importance to the 2030 Agenda for Sustainable Development (ASD) -adopted in September 2015- that sets 17 Sustainable Development Goals (SDGs). The goals are wide-tanging, from well-being, poverty, health, education, gender equality, decent work and economic growth, reduced inequalities, industry, innovation and infrastructure, to inclusive cities, clean water and energy, biodiversity, climate change and peace, justice and strong institutions. The iASES seeks to irrigate and inform the public debate on economic, social and environmental sustainability in Europe. These issues are complex and cannot be addressed with off-the shelf or one-size-fits-all expertise. Instead, an open and in depth analysis of hypotheses, empirical evidence, options and foreseeable consequences of possible policies is required. iASES highlights topics, that often go overlooked, yet are crucial to provide solutions to move the economy towards sustainable economic growth while maintaining price stability and full employment and preserving social progress The project tackles public finances, unemployment, public debt, and formulates alternative and more efficient strategies. 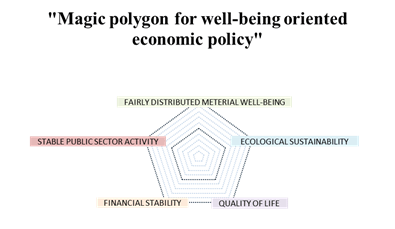 As a starting point, we rely on our magic polygon of well-being oriented economic policy (see below). After the 2007 financial crisis, our environment is being shaken up by increased inequalities, social and political unrest, the project leaders firmly believe in the need for an intellectually independent, conceptually pragmatic and fundamentally transparent analysis of the facts and policies that drive European economic, environmental and social progress now and in the future. Assessing the path of the policy mix in the Eurozone and EU, taking into account interdependencies between EU member countries and the rest of the world. Offering economic forecasts for current and next fiscal years. Taking into account the interaction between different policy positions of Member States and the ECB. Drawing on own assessments, evaluating the reliability of AGS policy and structural reforms recommendations. iASES provides in-depth analyses on Eurozone and major EU countries. Fiscal policy, monetary policy, labour market policies, social policies, and environmental policies are critical for the economic prospects of the EU and will determine institutional advances in the near future. OFCE, the French Economic Observatory, is leading the project in association with AK from Austria, ECLM from Denmark and IMK from Germany. The project is open and all material will be available under a creative commons licence. A Scientific Council, representing those institutes involved in the project as well as independent internationally renowned scientists, will evaluate the work, assess the organization of the project and advise iASES on the research agenda.